The one in Helvetiaplatz, also known as a the Fischbrunnen [Fish fountain]. 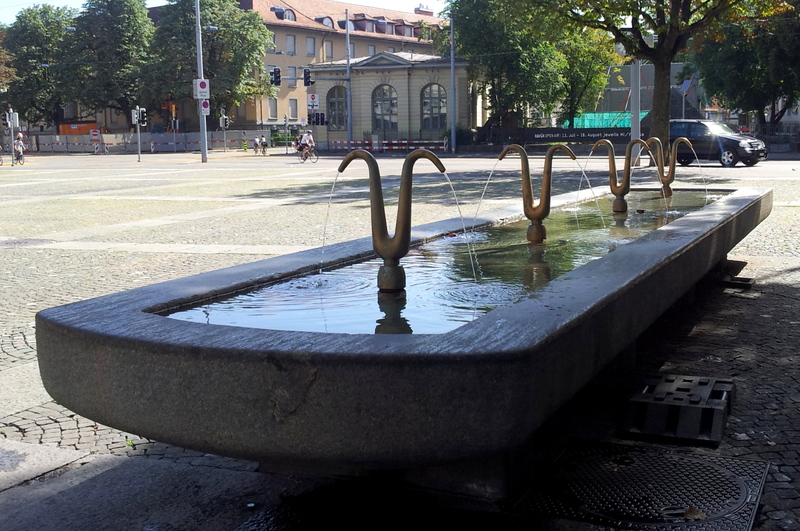 This is one of the most emblematic squares in Zurich. Every year, the May 1st and World Economic Forum demonstrations end up here. Otherwise, it is a quite a peaceful place often the stage of lively festivals and street parties. Built in 1953, this fountain was specially designed to help the fishmongers to prepare the fish for sale. The wide edges were meant to scale fish; the waste water would be collected in a chamber under it. The market eventually moved to another place in town, and the fountain refurbished in 1964. Dogs finally got their little fountain in 1999.